We’re well into the Dry season now and the birds come to water whenever they can. 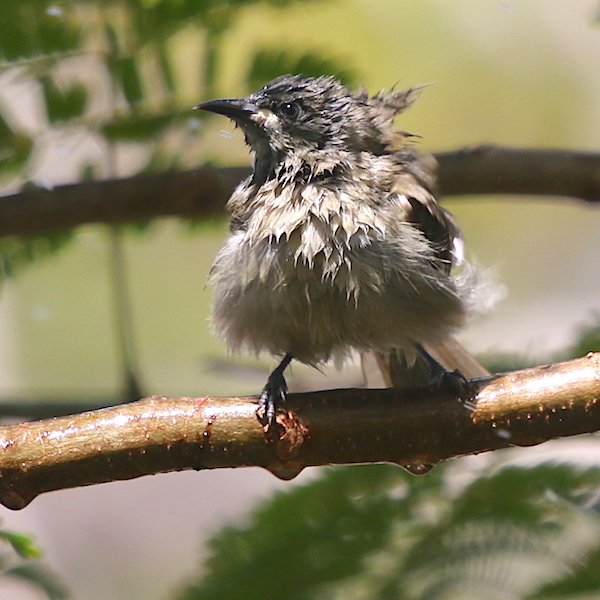 These White-gaped Honeyeaters (Lichenostomus unicolor) came to bathe under the sprinkler this morning. Rain? What’s that? We had a few drops (almost few enough to count individually) a couple of days ago, but before then? I had to look at the BoM’s records. They show we have had nothing over 0.2mm on any one day all the way back to early July when we had 12.4mm one day and a sprinkling on the days either side of it. June’s total was … wait for it … 2.2mm and in May the total was only 1.8mm. We had 10 mm in April but, really, it stopped raining at the end of March. The short days and cool weather of our winter don’t stop our butterflies completely but do slow them down. Numbers drop off, and their hours of activity shrink. As I noted years ago, most of them find quiet spots by about 3.30 each afternoon where they can rest safely until the temperature climbs again on the following morning. The one in my photo is doing just that, but I only spotted it because I saw it land. As this site says, it “depends on your definition of sleep. If you want to define sleep as an inactive, low metabolic state: yes. 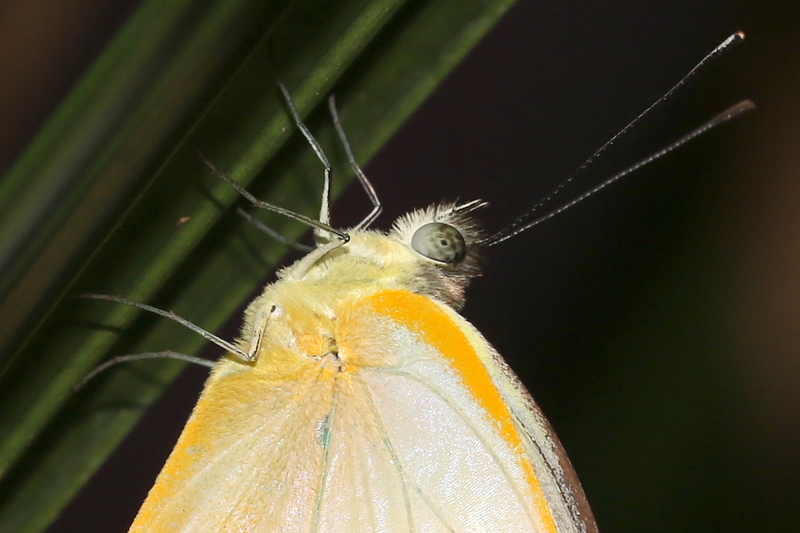 This low metabolic state is often driven by the temperature in the air.” Butterflies are ectothermic (“cold-blooded”, except that they don’t really have blood) so they need external warmth for their activity. An extension of their overnight “sleep” is the over-winter hibernation which carries adults of some species through a long period of low temperatures and limited food supplies, even here in the tropics. Probably not – but how could we know? Winter arrived yesterday, with its usual suddenness. As in most years, a big weather pattern somewhere down South pushed cold, dry air from Central Australia out over the ranges to Townsville. Overnight temperatures dropped, and the humidity crashed. Last year I reckoned the Dry arrived at the end of April, as it did in 2014 and 2015 so we’re running a couple of weeks late this year. In numbers, the changes are from overnight minimums of 18 – 21 C for the beginning of May down to 13.4 and 10.6 on the nights of the 12th and 13th, and humidity from 55 – 90% down to 16 – 19%. In daily life that means the cat becomes a permanent lap-rug, if he can get away with it, but we’re not permitted to stroke him because sparks leap painfully from the tips of his ears and tail. Meanwhile, we search for windcheaters we haven’t worn for six months and seek out patches of sunshine in the morning instead of drifting automatically into shade. Let me be clear, however: I am not complaining. I love this weather, and after a good Wet season I really look forward to it.